Pakistan's government has called on the army to deploy, after police were unable to break up a sit-in by religious hardliners. Islamist party activists on Sunday clashed with security forces for a second day on the outskirts of the capital, Islamabad, burning vehicles before withdrawing to a protest camp they have occupied for more than two weeks, police said. On Saturday, clashes in the city left up to 200 people injured and a number of deaths were reported. The Islamists want Law Minister Zahid Hamid to be sacked, accusing him of blasphemy after a reference to the Prophet Mohammad was left out of a new version of the electoral oath. As violence flared, private TV stations were ordered off the air. Facebook, Twitter and YouTube were also blocked in many areas, causing widespread dismay. "What the government did today to the media must be condemned," said Tahir Hassan Khan, former president of the Karachi Press Club. "The whole world will view this as an alarming development...It will also affect Pakistan's image globally. I believe the government should immediately reverse these decisions or else there will be negative consequences." 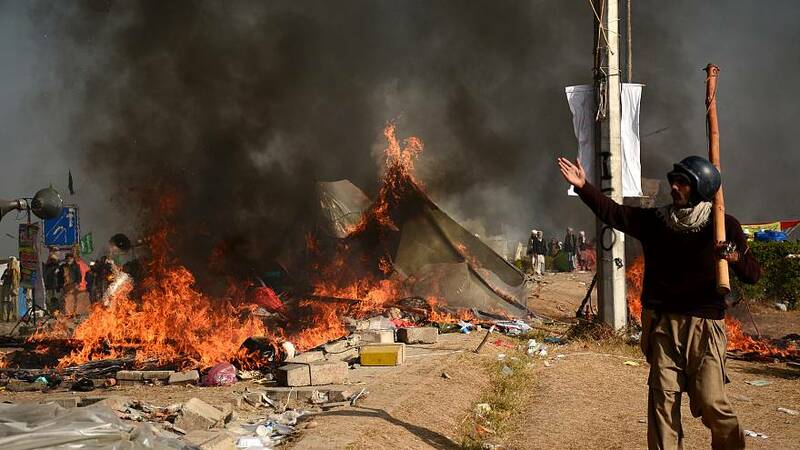 On Sunday morning, smoke billowed from the charred remains of a car and three motorcycles near the protest camp, where several thousand members of the Tehreek-e-Labaid party have gathered in defiance. Faced with the unrest, authorities blamed a clerical error for the wording on the oath and swiftly changed the language back. The police crackdown has done nothing to assuage hardliners' anger though and protests have spread to other cities. "We are in our thousands. We will not leave. We will fight until the end," Tehreek-e-Labaik party spokesman Ejaz Ashrafi told Reuters. Tehreek-e-Labaik is one of two new ultra-religious political movements that have become prominent in recent months. While Islamist parties are unlikely to win a majority, they could play a major role in elections that must be held by summer next year.